Time flies, looking back, I have been into blogging since 2005 and had organised quite a few bloggers' get together. I enjoyed tremendously in meeting bloggers that I have been following. It is always nice to put a face to a blog that you have been visiting and broaden up our social circle, especially for homemakers. The greatest joy is to have like minded people coming together to yak over meals that each prepared. We brought to reality those yummy dishes that we drooled over while we blog hopped, we also share our kitchen experiences and knowledge with each other. This particular afternoon, the sharing was an eye opener for me. I also get to learn more from others’ parenting journey. The sharing is immensely enriching. Thank you ladies! Next round, I will definitely organised one for us as well as for our kids. For this gathering, initially I wanted to cook curry but since I have been cooking curries for my previous parties, I should make some changes. My little one had been eating Lor Mai Kai from school quite often. She said it is the easiest as she need not have to queue long for her food during recess time. Since I have not venture into this type of recipe, I decided to give it a go. I am please that I gotten good feedback from it. Next round, I will not be too health conscience about it and add in a little chicken fats. Guess no harm if it is not on a daily diet. Thanks to YA for bringing home a bottle of this super hot chilli sauce from Sabah. Luckily EN warned us about the potency of this sauce. A very good compliment sauce to my lor mai kai! Now let me share my lovely scrumptious feast I had this afternoon. 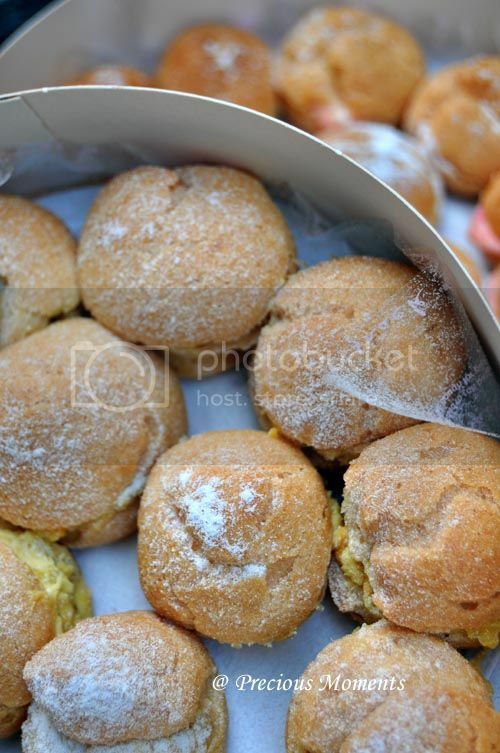 From ScrumPtious-FlaVours - Durian and Strawberry cream puff. Totally to die for. From Cook with No Books - Orr Nee. 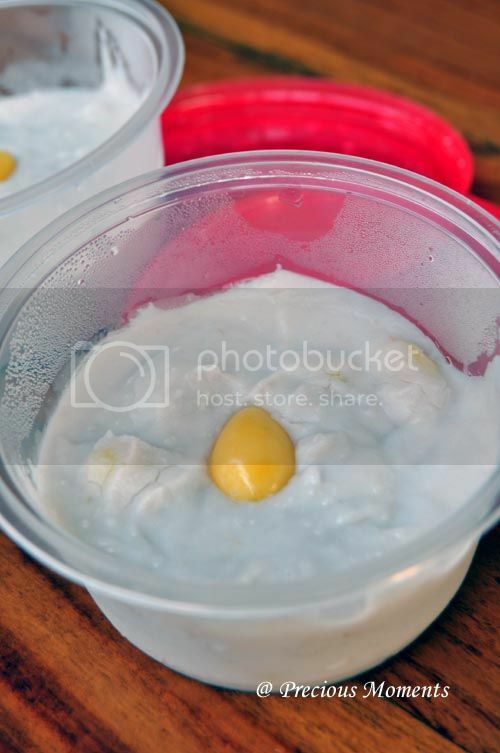 One of my all time favourite Teochew dessert. 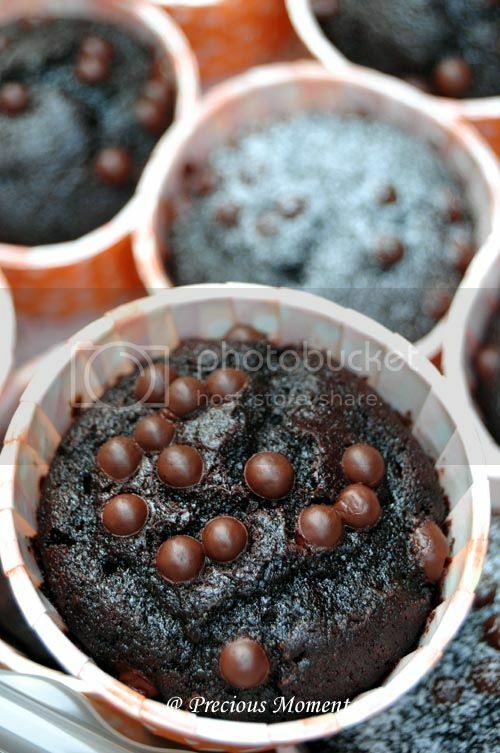 From 最爱的, this chocolate muffins is intense and delish! 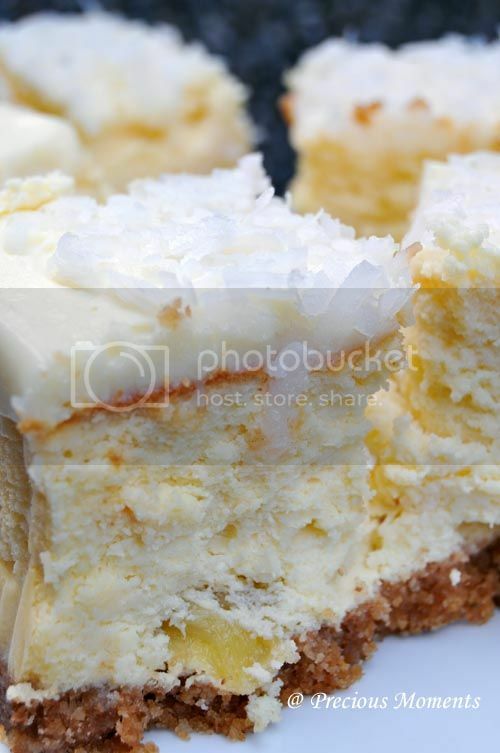 From The Batter Baker - Coconut and Pineapple Cheesecake, after this one, I am now a coconut convert. 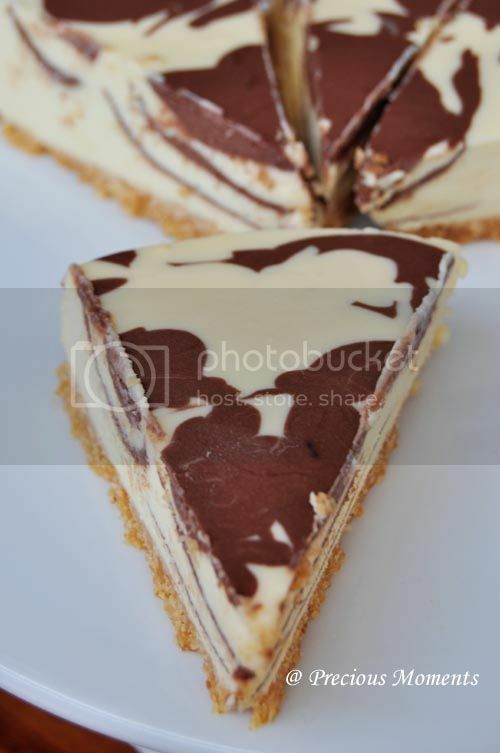 From Cosy Bake - Marble Cheese cake - Look pretty and taste good. Thanks girls giving up your family time and spending the afternoon with me. Also thanks for your generous flowers and gift. A wonderful afternoon I had. Hope you did too. Season chicken with marinating sauce for 1 hour or best overnight (chilled). Fry sliced shallot with oil till brown and fragrant. Remove but leave a little oil inside the wok. 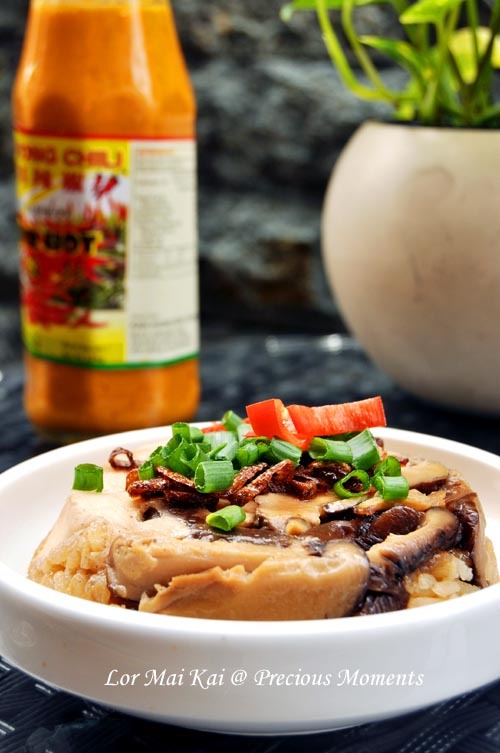 Add in 2 tbsp shallot oil in the wok, and add in soak glutinous rice and mixed in the fried shallots. Add in salt, dark soya and light soya sauce into the water. Add in seasoned water into rice and gently mixed till shallots is well distributed. Slowly simmer and kept stirring till water is reduced and rice is semi cooked. Greased cup with oil and arrange chicken strips and mushroom to cover the base. Next add in the glutinous rice. Using a gloved hand, firmly pressed the rice to the cups. Make sure it is level. Steam for 30min or till cooked. Thanks for making time to join us. Your dessert was yummy. Lots of hard work put into it. Thanks for dropping by Anne. If you have a blog, will keep you posted on our next gathering. Wow ... just missed the gathering and goodies. Thanks Edith, I enjoyed the time with you gals! Shall meet again soon!